When it comes to 1980s pop culture, it’s easy to envision bubblegum highlights like big hair, obnoxious fashion (here’s looking at you, shoulder pads and leg warmers! ), synthesizers and megastars like Madonna, Prince or Whitney Houston. But there was also a much grittier, dirtier side to this Decade of Excess, and accounts of decadence don’t get much raunchier than those of legendary glam rock band Mötley Crüe. Audiences were first given an inside look into Mötley Crüe’s wild (to put it very mildly) antics in their 2001 memoir and New York Times Bestseller, The Dirt: Confessions of the World’s Most Notorious Rock Band the band co-wrote alongside author Neil Strauss. Director Jeff Tremaine (JACKASS: THE MOVIE, BAD GRANDPA) brings this rowdy autobiography to life with his newest film for Netflix, THE DIRT. Presented in first person through the lens of the band members who lived it, THE DIRT chronicles the story of how Mötley Crüe—a band comprised of “an old man, kid drummer, a cover band singer and a f***ing runaway”—blasted to superstardom in the early 1980s, drinking, snorting and shooting their way to the highest of highs and most extreme of lows. 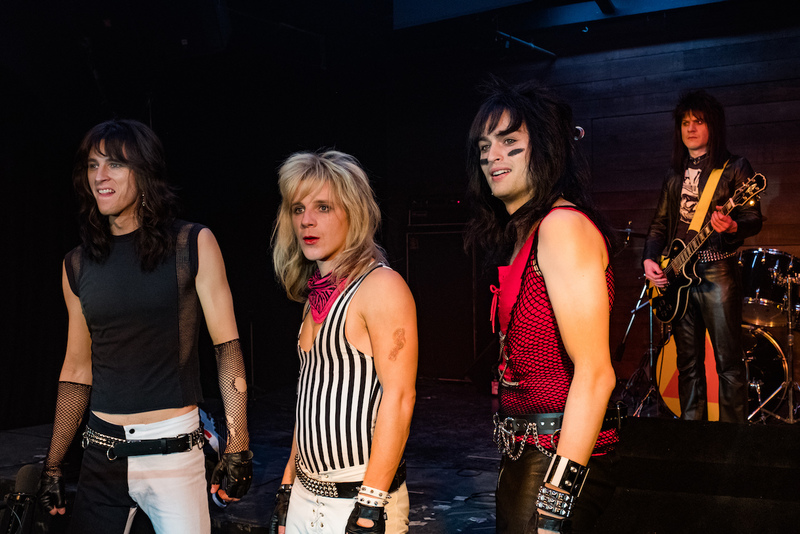 The band members get their onscreen second wind with the help of actors Douglas Booth as bassist Nikki Sixx, Iwan Rheon (GAME OF THRONES, MISFITS) as guitarist Mick Mars, Colson Baker (aka Machine Gun Kelly) as drummer Tommy Lee and Daniel Webber as singer Vince Neil. Coming in at just under two hours, THE DIRT is chock full of firsthand Mötley Crüe accounts — including Mars’ degenerative spinal disease diagnosis; Lee’s marriage to actress Heather Locklear; Neil’s 1984 car accident that resulted in the death of Hanoi Rocks drummer, Razzle; and Sixx’s 1987 heroin overdose — and goes from zero to 60 from the opening scene moving forward. Overall, film’s pacing can seem a bit rushed at times, but Tremaine and writers Rich Wilkes and Amanda Adelson do a good job of condensing the band’s decades-long career with very few lulls in storytelling—which is good news for those of us whose attention spans are used to the fast-paced nature of 21st century life. 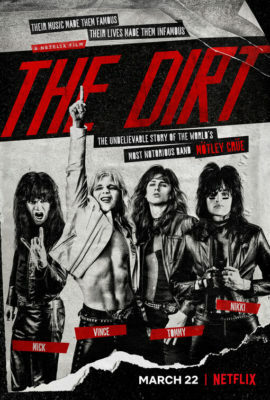 THE DIRT is a fun, if not sugar-coated film that Mötley Crüe fans —old and new — are sure to enjoy. It’s as close as you can get to the band’s prodigal lifestyle without a time machine, numerous stints in jail or multiple disorderly conduct citations. So put on your (p)leather pants, tease your hair, buckle up and get ready to rock out and enjoy the joyride that is THE DIRT. THE DIRT had its world premiere on Monday, March 18, 2019 at ArcLight Hollywood in Los Angeles, California. The film is available for streaming today on Netflix.